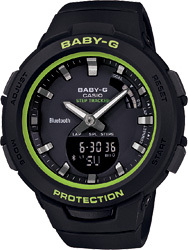 Introducing new lime green accented models from the G-SQUAD BABY-G sports lineup that adds plenty of style to daily workouts and training. Basic black and white colors are dressed up with lime green accents and metallic hour markers to create designs that are stylish and exciting. Other features include an Auto Double LED Light to facilitate workouts in areas where lighting is dim. Daily health and fitness support functions include a 3-axis accelerometer that keeps track of your step count, a timer that lets you create up to 20 combinations of five timers each, memory for up to 200 lap records, a step reminder feature that alerts you when your step count over a specific period is too low, and more. 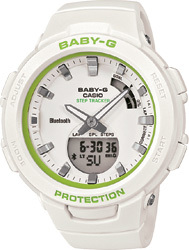 These models are Bluetooth® capable, which allows them to link up with the BABY-G Connected smartphone app for simplified management of daily activity logs and configuration of exercise settings. 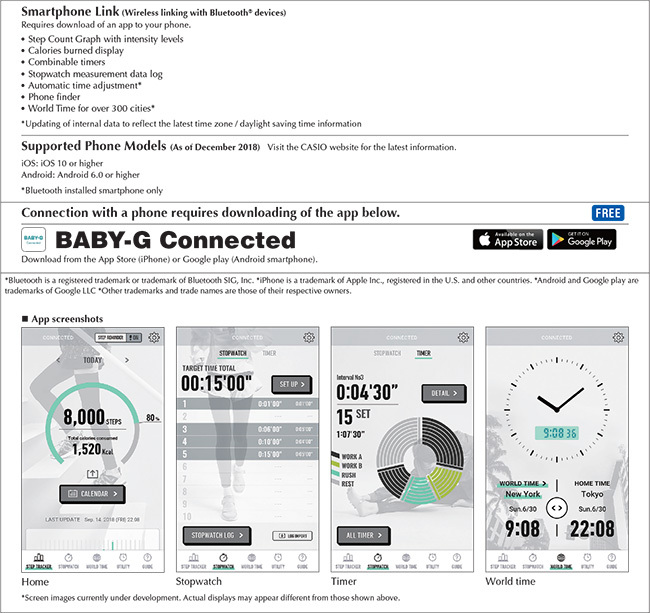 Supported phone-based operations include calorie calculations and step targets, creation of timer combinations for interval training, a step count log with five exercise intensity levels, storage of stopwatch measurement data, batch viewing of calendar data, and more. Smartphone Link also enables auto time adjustment and other timekeeping operations.